So we’ve lost a legend. I’ve seen so many wonderful tributes* to Jack Bogle over the last few hours that there’s nothing I feel I can add about the man that hasn’t already been said. I had the privilege of meeting him twice. I didn’t know it at the time, but our first meeting, seven years ago, changed my life. I was interviewing him for a documentary called Passive Investing: The Evidence. There was something about him — his humility and integrity, but also his charisma and sense of purpose — that made an instant and lasting impression on me. I was, in those days, a rather tired, jack-of-all-trades television journalist, looking for a new professional challenge. I knew little about investing, but it was meeting Bogle that made me resolve to learn about it. The more I read, the more it intrigued me that, despite the mountains of evidence on the best way to invest, most people did pretty much the opposite. Worse still, they were positively encouraged to invest the wrong way by just the people who should have been helping them. Jack Bogle was like a voice in the wilderness. To cut a long story short, investor education and, to use Bogle’s phrase, helping to give ordinary investors a fair shake, became my life mission. When that first documentary came out, Bogle sent me one of his trademark hand-written notes, complimenting me on it. Two years later, I returned to Vanguard’s Malvern headquarters to interview him for a second documentary, How to Win the Loser’s Game. Between them, those two films have been viewed almost a million times, and much of that success I put down to Bogle’s sheer star quality. You can expect plenty more content from TEBI on Bogle’s life, work and philosophy over the coming days and weeks. For now, though, I’ve made this video summarising my thoughts on what his legacy is. 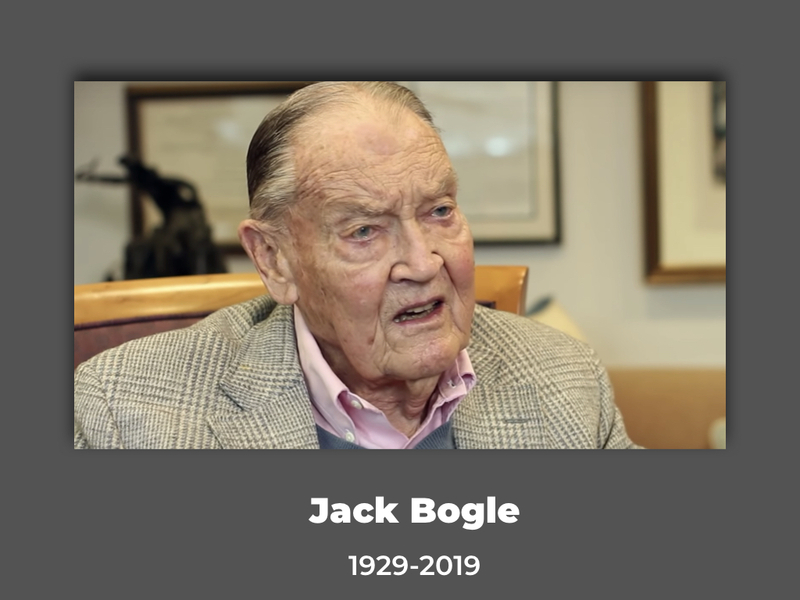 *This obituary in the Philadelphia Inquirer is beautifully written and really captures the essence of Jack Bogle the man; this video by Jason Zweig at the Wall Street Journal is also well worth watching.